February 25th, 1995, we married at St. Vincent's Church, had the greatest party ever at the KC Hall in Jackson and then headed off to our honeymoon. When we arrived, we opened a gift from my mother in law. It was the Dr. Seuss book, "Oh, The Places You'll Go!" We had big dreams about all the places we would Go. We dreamed of traveling all over the country. We've been able to Go most directions, South, East and even West. 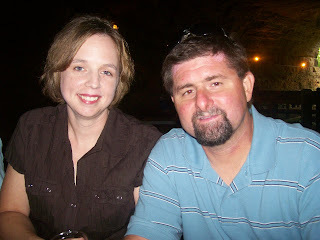 We even had the chance to Go to Aruba a few years back. We have been able to Go to many of the places we dreamed about. And we've been to lots of places we never dreamed we would Go. We never dreamed we would find ourselves Going to the hospital a month early to have a baby and getting there just in time to save her life. We didn't know that we would then Go to numerous doctors and other medical professionals a few years later to figure out what was wrong with her. We never knew we would Go to the nursing home to face a grandmother who no longer recognized us. We certainly never dreamed we would Go to the oncologist to see how we would fight cancer. We surely never thought we would Go to the funeral of my sister's newborn son. But the great thing about our marriage is that we Go together, hand in hand, to face what lies before us. The good and the bad. It's a good thing Dr. Seuss didn't specify exactly where we would Go. We might have decided to just toss the marriage certificate and Go our separate ways. Instead, we stayed together through all of the surprising places we would Go. And we will most likely continue Going places we never dreamed of Going. Both good and bad. Scott, I love you and hope we have many years ahead of us. Congratulations Michele and Scott. You have a wonderful family. I am blessed to have met you. I'm sorry I missed you your last visit to NWA. Enjoy anniversary! Damn! Not the first time your blog has made me cry! Happy Anniversary! Longevity is such a gift. I'm so proud of you two! Nice post. Happy 15th to both of you, here's to 15 more. I know I'm late...okay really late but HAPPY ANNIVERSARY!!!!! I'm sitting here at 7 am and find myself crying like a baby!!! I hope that Justin and I will be able to endure (if life should throw us in that direction) everything that you and Scott have with such grace. I am so glad that God brought me into your lives. I love you all! !